June 24 is the 175th day of the year(176th in leap years) in the Gregorian calendar.There are 190 days remaining until the end of the year. 1880 – First performance of O Canada , the song that would become the national anthem of Canada, at the Congrès national des Canadiens-Français. 1949 – The first television western, Hopalong Cassidy , is aired on NBC starring William Boyd. 1957 – In Roth v. United States , the U.S. Supreme Court rules that obscenity is not protected by the First Amendment. The solar eclipse mentioned in a text dating to the reign of Mursili II could be of great importance for the absolute chronology of the Hittite Empire within the chronology of the Ancient Near East. The text records that in the tenth year of Mursili's reign, "the Sun gave a sign", just as the king was about to launch a campaign against the Kingdom of Azzi-Hayasa in north-eastern Anatolia. Gaius Flaminius C. f. L. n. was a leading Roman politician in the third century BC. Twice consul, in 223 and 217, Flaminius is notable for his Lex Flaminia land reform of 232, the construction of the Circus Flaminius in 221, and his battle against Hannibal's army in 217 during the Second Punic War where he was defeated and killed. Flaminius is celebrated by ancient sources as being a skilled orator and a man possessed of great piety, strength, and determination. He is, however, simultaneously criticised by ancient writers such as Cicero and Livy for his popular policies and disregard of Roman traditions, particularly during the terms of his tribunate and second consulship. Abu 'Isa al-Warraq, full name Abu 'Isa Muhammad ibn Harun al-Warraq, was a 9th-century Arab skeptic scholar and critic of Islam and religion in general. He was a student of Ibn al-Sarrāj and Ibn Duraid and mentor and friend of scholar Ibn al-Rawandi in whose work The Book of the Emerald he appears. A modern scholar of the Quran and critic of Islam, Ibn Warraq, derives his pseudonymous name from al-Warraq. Year 1046 (MXLVI) was a common year starting on Wednesday of the Julian calendar. 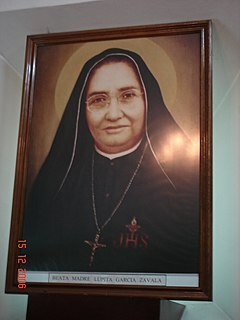 Saint María Guadalupe García Zavala - born Anastasia Guadalupe García Zavala - was a Mexican Roman Catholic nun and the co-foundress of the Handmaids of Santa Margherita and the Poor. She is also known as "Mother Lupita". At one time, she was engaged to be married but she decided her religious call was too strong for that and she broke off her engagement in order to pursue this call. She dedicated herself to the care of ill people and was noted for her compassion and faith. The Nativity of John the Baptist is a Christian feast day celebrating the birth of John the Baptist, a prophet who foretold the coming of the Messiah in the person of Jesus, whom he later baptised. May 29 is the 149th day of the year in the Gregorian calendar. There are 216 days remaining until the end of the year. ↑ Baron Michael Morris Killanin; Michael V. Duignan (1989). The Shell guide to Ireland. Gill and Macmillan. ↑ Tony Jaques (2007). Dictionary of Battles and Sieges: A-E. Greenwood Publishing Group. p. 215. ISBN 978-0-313-33537-2. ↑ Alan W. Ertl (2008). Toward an Understanding of Europe: A Political Economic Précis of Continental Integration. Universal-Publishers. p. 300. ISBN 978-1-59942-983-0. ↑ Clifford J. Rogers (2010). The Oxford Encyclopedia of Medieval Warfare and Military Technology. Oxford University Press. p. 1. ISBN 978-0-19-533403-6. ↑ Robert White (1871). A History of the Battle of Bannockburn, Fought A.D. 1314: With Notices of the Principal Warriors who Engaged in that Conflict. Edmonston and Douglas. p. 77. ↑ Plantagenet Ancestry: A Study In Colonial And Medieval Families, 2nd Edition, 2011. Douglas Richardson. pp. 1–. ISBN 978-1-4610-4513-7. ↑ Peter G. Bietenholz; Thomas Brian Deutscher (2003). Contemporaries of Erasmus: A Biographical Register of the Renaissance and Reformation. University of Toronto Press. pp. 217–. ISBN 978-0-8020-8577-1. ↑ Morris, Steven (24 June 2018). "TV chef Clarissa Dickson Wright dies". .theguardian.com. Retrieved 14 April 2014. ↑ Lentz, Harris M. (2014-02-04). Heads of States and Governments Since 1945. Routledge. pp. 379–380. ISBN 9781134264902 . Retrieved 2018-06-21. Wikimedia Commons has media related to June 24 .